Walk to beach- 5 bedroom 2 bath. Booking now through fall getaways! 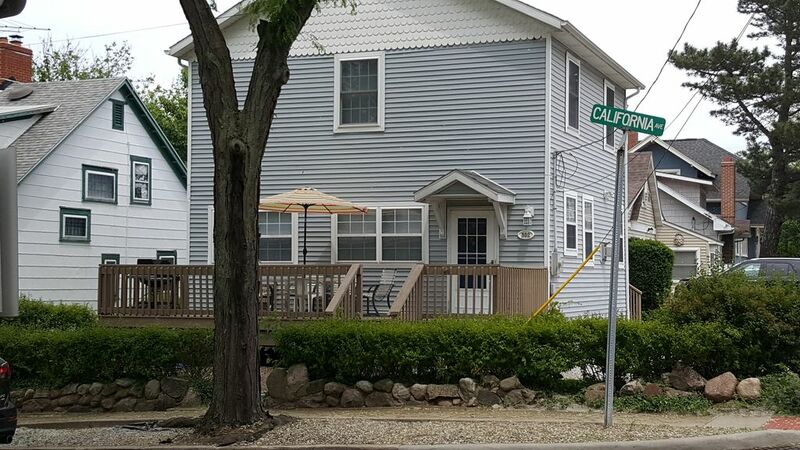 Spend a winter weekend or book your summer retreat in our cozy remodeled, two story, five bedroom, two full bath home located in the Sheridan Beach area of Michigan City. Spend a day at the beach or just relax with a book on our deck. If you are looking for something to do - we are within walking distance to the Park, the Zoo, or to the Marina. Bring your bikes, we have miles of bike trails. Jump in the car and try your luck at the Blue Chip Casino. In the mood for shopping? The Lighthouse Outlet Mall is hard to beat. Check out this website about Michigan City. I am married with 2 boys. We have property here and in Marco Island. I love the beach and it is one of my favorite places to visit. Great common area to gather after a day at the beach! Kitchen table plus outdoor seating. We had plenty of sleeping space with 5 bedrooms. The downstairs bedroom became the main play room for the kids. Only suggestion would be that cleaning staff provide extra trash bags for kitchen and additional toilet paper. The boxes of tissue were appreciated since this is the season of cold! We stayed at the house for our daughters wedding. We loved it. It has beds for like 14 or something, it’s crazy. We only used like 5, people ended up crashing at other houses after parties. So we had so much more room for activities. We would stay there again. It was super clean. Highly recommend. It was a neighbors weekend with 6 ladies. We loved the location and all the space in the home. It was a great location. Our contact Cari was very accommodating. It worked for the six of us. We plan to book here again for the next year. We stayed at the cottage for our family vacation and really enjoyed the space. The previous 3 years we had stayed at hotels and found that it was hard to spend time together in the evening. We had 8 adults and a two year old. Every couple had their own room which was good for privacy. We went to Four Winds Casino which is a really cool place and if you like to gamble a little it is fun. Their is a local beach within a block that we walked to everyday. The house has an outdoor shower that was great for getting the sand off before going inside. There is a small zoo & a splash pad close by that was great for younger kids. There is a Meijer within 5-7 miles which had everything we needed. We cooked all our meals at the house so I have no recommendations for places to eat. With that being said, the grill looks like it could use some maintenance or even be replaced. Only half of the burners were working well and it made it a little difficult to cook all our meat at one time. But we made due. The Lighthouse outlets near by were a great activity for a rainy day and we found some pretty good deals. The only other thing I wasn’t aware of was the arrangements for picking up and dropping off the key. It did not make a difference for us since we were leaving earlier in the day but the keys are picked up at a real estate office and it is recommended to pick up by 5 pm central time. The time change helped us since we were traveling from Michigan to Indiana and we gained an hour. The “list of things that need to be done before you leave” letter that you receive with the key comes across much more demanding than what it really requires. Just have to do a couple loads of laundry and straighten up. Overall this is a place we would stay again. Reasonably priced and very functional for a larger group. Accomadated our family well. Kitchen had everything u need. Only complaint I heard was some matresses were uncomfortable. All in all was a good experience and will definitely book again.